By Kelsey // Giving Back, Good People Podcast, Where Am I Giving? After a year of my friend Jay Moorman bugging me about doing this…I started a podcast. The Good People podcast explores what it means to be good by talking to everyday heroes, philanthropists, altruists, and do-gooders. I hate cards. It’s okay getting them, but I don’t like buying them. It seems so impersonal and as a writer, I feel like it’s just lazy. See, seems kind of dumb. Maybe I’m too focused on the giving of the card and not what the most important part is: the shopping for the card. In those moments of shoebox greetings and Hallmark hell, you stop and think about someone you care about…. Is awareness a burden or the key to happiness? 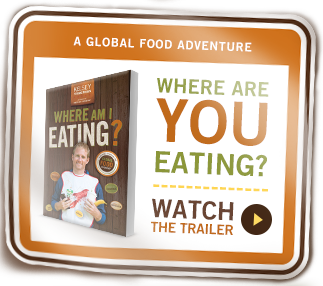 That was a friend’s reaction when I told him I was researching the book that would become WHERE AM I EATING?, a book in which I traveled around the world to meet farmers who produce chocolate, bananas, coffee, lobster, and apple juice. The cocoa farmers I met in West Africa lived in poverty. A worker on a cocoa farm was enslaved. Child labor. Environmental degradation. Economic impacts of a changing climate. There were plenty of issues to be aware of. So…did this awareness ruin chocolate for me? In high school I drove a black Firebird. It was a ‘93 Trans-Am, the first year for the curvaceous f-body, with a 275-horse-powered LT1 engine. The same engine the Corvette had. It wasmy dream car then and now. The license plate read: BATMBLE. Batmobile. I’d be lying if it ended with the license plate. I had Batman floor mats. I had the soundtrack to the first Batman movie, the one with Michael Keaton, in the CD player. I loved blaring it on fall nights, leaves swirling where the Batmobile had been. I occasionally got nuts in the Batmobile…. I went for a three-mile run down my Indiana country road yesterday on December 31st, 2018. It was 60-degrees. That’s not okay normal. It’s a terrifying new normal to which I still can’t adjust. Even though I knew the temperature, I still dressed for a December run. I ran past a field of unharvested corn, each stalk broken or bent, sewed but not reaped. I was hot and wished I had worn shorts…in December…in Indiana…while running outside. The realities of our changing climate are no different than they were a few months ago, but humanity’s understanding of them has made the prognosis even more dire. We’re now aware that the world is in worse shape than we thought it was. By Kelsey // Giving Back, Where Am I Giving? Poverty, like death, is something that is all around us, but we like to pretend it doesn’t exist and could never happen to us.